KANSAS CITY, Mo. 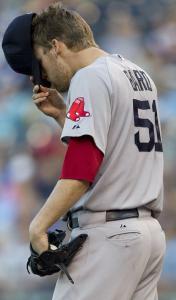 - Daniel Bard had thrown only 86 pitches through seven innings Tuesday night, so sending him out to start the eighth against the Royals wasn’t a difficult decision for Red Sox manager Bobby Valentine. Bard had never gone beyond seven innings before but he had efficiently handled the Royals, one of the worst teams in baseball. “I thought he was in complete control of the game,’’ Valentine said. But like so many other well-reasoned decisions made by the Sox, this one proved incorrect. Bard walked the first two batters of the inning, then Billy Butler hit a long home run off Matt Albers as the Royals rallied to beat the Sox, 6-4. It was the sixth loss in the last seven games for the Sox, now 12-17. Valentine was still in uniform when reporters spoke to him, shaking his head several times as he discussed the game. Bard was equally distressed, upset that he couldn’t finish the game off. A power pitcher as a reliever, Bard had only one strikeout but got 15 outs on groundballs, using his fastball to create contact against the aggressive Royals. His only poor inning was the second, when three singles, two balks, a wild pitch, and a walk resulted in three runs. Bard also had worked out of a jam in the seventh. With runners on second and third and one out, the Royals tried a squeeze bunt. First baseman Adrian Gonzalez foiled it with a quick throw to the plate. Catcher Kelly Shoppach blocked Jeff Francoeur before applying the tag. Bard then struck out Humberto Quintero to end the inning. Bard went back out for the eighth and learned a lesson instead of earning a victory. “There is a fatigue that sets in. It’s about learning how to pitch with that little bit of fatigue,’’ Bard said. “It’s not my arm; my arm felt great. It’s your whole body, your legs, your lower back, everything. Bard (2-4) walked Jarrod Dyson and Alex Gordon on 10 pitches, the last five missing the strike zone as he lost his release point. Dyson and Gordon had been 0 for 6, grounding out all six times. “I was just trying to do too much,’’ Bard said. Albers threw three straight sinkers to Butler hoping for a double play. The third pitch stayed up in the strike zone and Butler drove it deep to left field for his sixth home run of the season. Albers had thrown 9 2/3 consecutive scoreless innings in his previous seven appearances and had allowed only two of the nine runners he inherited to score this season. “I don’t think there’s an alternative. He’s pitched great,’’ Valentine said. The Sox scored four runs over the first five innings but were stopped there by the Kansas City bullpen. Kelvin Herrera, Jose Mijares (2-1), and Jonathan Broxton (sixth save) held the Sox to two hits over the final 4 2/3 innings. The Sox have scored an average of 3.8 runs in the games Bard has started. Kansas City starter Danny Duffy became the latest lefthander to have a rough night against the Red Sox. He gave up four runs, three earned, in 4 1/3 innings. Will Middlebrooks doubled with one out in the second inning, took third on a single by Marlon Byrd and scored on a single by Shoppach. Mike Aviles and Dustin Pedroia drew walks to force in a run. David Ortiz had a chance to do some major damage but flied to center. Middlebrooks did not come out for the bottom of the inning because of a tight left hamstring, a condition that caused him to miss a game last week. He is hitting .409 with seven extra base hits in five games since being called up. The Sox added single runs in the fourth and fifth innings against Duffy. Aviles, a former Royal, doubled with two outs in the fourth inning and scored on a single by Pedroia. Gonzalez, who turned 30 Tuesday, doubled to deep center with out in the fifth inning. He later scored on a fielder’s choice. Before he took a shower, Bard sat in front of a laptop computer in the clubhouse and reviewed parts of the game to figure out where he had gone wrong. Red Sox notebook What to do with Will Middlebrooks?